GSMArena team, 19 September 2014. The Xiaomi Redmi 1S comes with a custom Gallery app. It defaults to your camera roll with two shortcuts at the bottom that will take you to album view of your local images and album view of your cloud pictures. You can't change this view, nor can you customize the default folders. The MIUI music player is a custom app with a well-laid out, easy to navigate interface. It has a huge visualization screen doubling as a Now Playing windows. Below you get four non-customizable tabs - All Songs, Artists, and Playlists. Xiaomi's Music app offers customizable equalizers with a few default presets already available for use. You can also try Xiaomi's MiSound enhancer, which comes into play when you use headphones, and especially, a Xiaomi-branded set. Xiaomi Redmi 1S does not feature a separate video app. Instead you have to browser your files via the image gallery or the file explorer app. We suggest using the latter (Explorer), because the Gallery doesn't recognize MKV and WMV files. The video player interface is very basic interface but there is rich video codec support. It managed to play everything we threw at it (including MKV and WMV files). The AC3 audio codec is supported too. Subtitles and pop-up play are not supported by the MIUI's video player. Given the uninspiring performance of its Mi3 and Mi4 siblings, we didn't really have very high expectations about the Xiaomi Redmi 1S audio output. However the entry-level smartphone not only wasn't much worse than its colleagues, but it was even slightly better overall. When connected to an active external amplifier the Redmi 1S showed great excellently low noise levels, very good and no distortion whatsoever. Add the spotless frequency response and you only have the disappointingly low volume levels as a drawback to this performance. 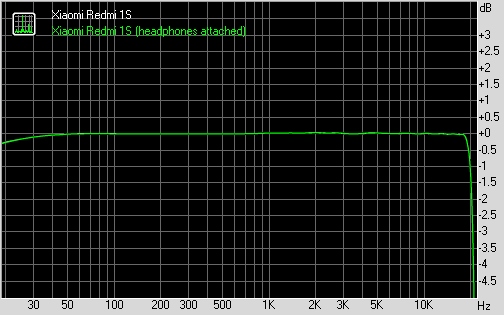 Even better, besides the extra stereo crosstalk, there's virtually no degradation when you plug in a pair of headphones. This would have been a solid showing even if the phone was retailing for twice as much, but in this price range we really have nothing to complain about (yes, moaning about volume levels on a $100 handset in unacceptable).